Team NEVS and team Sono Motors in Trollhättan. (PRLEAP.COM) First series production SEV to be manufactured at former SAAB plant in Trollhättan. 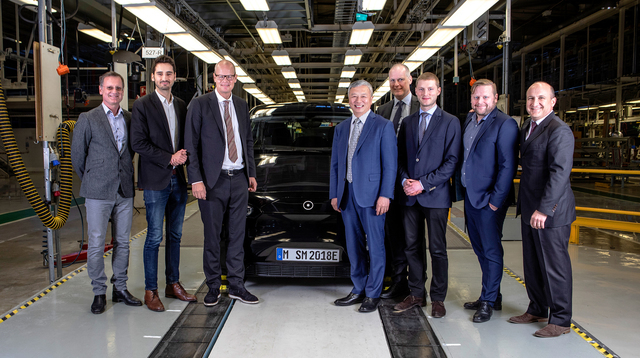 "In NEVS, we found the perfect partner for us," says Thomas Hausch, Chief Operating Officer, Sono Motors. "Together, we share a vision of intelligent and resource-conserving mobility. We also value our partner's specific expertise based on their many years of experience in traditional automobile development and production in combination with proven expertise in the area of electromobility." The innovative vehicle concept of the Sion already represents tomorrow's mobility today – the aim of which needs to be the reduction of vehicles on the roads through more sustainable and more efficient usage. The Sion will therefore be equipped ex works with integrated sharing options. These enable the owner to share the vehicle itself, individual journeys, or even energy via a mobile application (goSono app), developed by Sono Motors. A bidirectional charging function enables the Sion to both receive and supply electricity, power electrical devices independently, and feed energy to other vehicles or into the electricity grid. Thanks to full-surface solar integration, the vehicle battery can be charged with pure and free solar energy worth up to 34 kilometers' range per day in addition to its regular WLTP range of 255 kilometers. For its market launch, the Sion will be rolled out in one single variant version costing 25,500 euros. There are plans afoot to develop other vehicle models based on the vehicle's platform. The first prototypes were produced in 2017 with the support of renowned investors and crowdfunding, and have since been driven and experienced by more than 13,000 potential customers at test-drive road shows. The overwhelming response to the vehicle and mobility concept confirmed the company founders' vision and is turning it into reality – the Sion electric car is going into series production.